Trouble ahead for fruit trees? As I admired my February Gold daffodils blooming in January, about three weeks ahead of schedule, I ruminated on the impact of the warm, wet December and the sunny, dry January we've had so far. In an average January we have 18.5 cloudy days. This January we've had three. Not that most gardeners are complaining about the sunshine, but that means that daytime highs are above average. The storms in December were very warm, and much of the month was above average. We've only seen a few frosty mornings so far. Overall our winter has been mild. Unfortunately, some of our important crops and garden plants count on having a normal amount of winter cold. Farmers are keeping a wary eye on these temperatures. Growers of cherries, pistachios, and walnuts already know their yields could be low this year. But the problem could extend to other tree crops. There will be adverse impact on the state's economy. And you may see reduced fruit production in your back yard as well. What are the effects of low chilling units? Fruit tree scientists (pomologists) have known for years that many species require a certain number of hours below 45 degrees and above freezing. The trees have evolved mechanisms that prevent dormant buds from growing until a certain amount of chilling, and then a certain amount of warming, has occurred. With insufficient chilling, the trees leaf out later (delayed foliation). Flowers don't develop properly. Flowers open over a longer period of time. Pollination doesn't happen properly. Pollenizers don't overlap sufficiently in bloom to provide the right pollen when the flower is receptive. Fruit yield and quality are reduced. It's easy to see the evolutionary adaptation to delaying flowering until freezing weather is past. Orchardists and home gardeners should look for varieties appropriate to their region as to the number of "chilling hours" required. If you're gardening in coastal or Southern California, you can't grow the same varieties that do so well for us up here. Usually do well, that is. We average over 800 hours of chilling here most years. 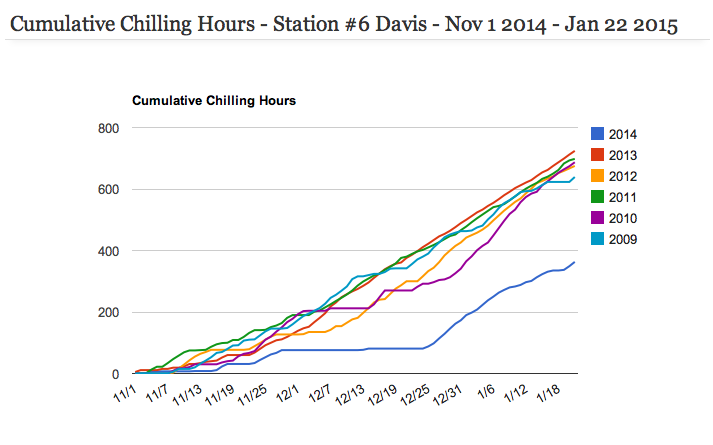 Last year by January 20 Davis had 699 chilling hours, on the way to a seasonal total of 871. This year? Less than half: 337 chilling hours to date, and the weather forecast has warmer weather on tap for the coming week. I had to go back to 1995 to find a year comparable to 2015. How did we do that year? 545 chilling hours by the end of February. California's apricot crop in 1995 was down 49%. We've only got a few weeks left for stone fruits to accumulate enough chilling hours. If temperatures are at or below average, we will likely get to a little more than 500. But unfortunately the current weather forecast shows a warming spell. Above average temperatures are not the farmer's friend right now. As it stands, cherries and walnuts are likely to have problems, as are some of your apples, pears, nectarines, and peaches. There's an added wrinkle. The old models for chilling hours just counted the number of hours between 32 and 45 degrees. Temperatures below freezing don't help. Temperatures above average weren't factored in. But research shows that when daytime temperatures are higher than average, chilling hours are reversed to a degree. Pomologists now measure the plant's dormancy requirement in "chilling units." These have not been fully worked out for every species and variety, but the bottom line is that unusually warm weather makes things worse. 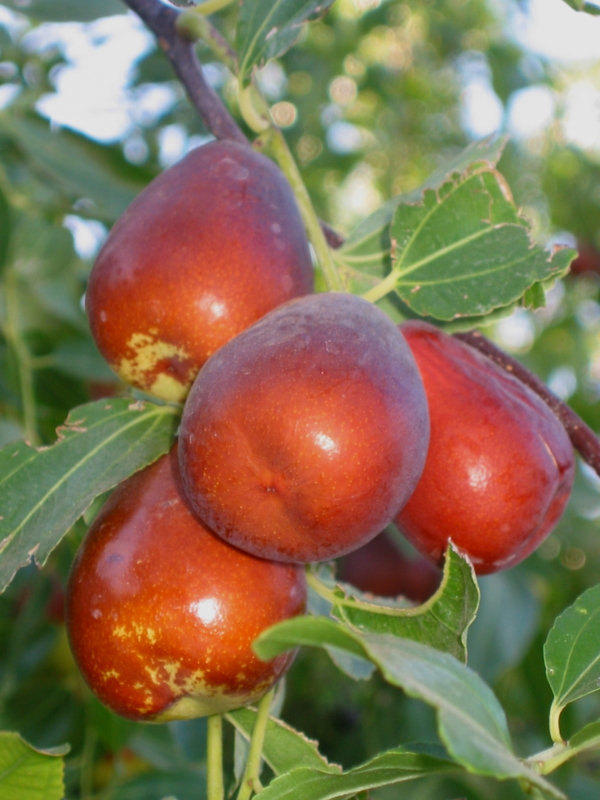 As if they didn't have enough problems already with Spotted wing drosophila infesting the fruit, and drought affecting water supplies, California's cherry growers got an unpleasant surprise in this regard last year. Cherries are a high-chill crop, with most commercial varieties requiring 800 or more hours. We had plenty of chilling hours, but high temperatures during January and February 'undid' those. The trees' flowers didn't develop properly and didn't set fruit. The USDA reported that California's cherry crop in 2014 was 63% below 2013. Many home gardeners had no fruit on their cherry trees last year. 2015 looks like a repeat. Other than higher prices at the grocery store, what does all of this have to do with you? Your backyard harvest is likely to be low, perhaps very low, on some of your fruit trees. Others will do fine. Chilling requirements vary by species and variety. * Very low chilling requirement, nothing to worry about: figs, berries, grapes, jujube, mulberries, persimmons, pomegranates, and quince. * Moderately low chilling requirement, yields should be fine: blueberries (Southern highbush, the most common here), Japanese plums, pluots and apriums; almonds and pecans. * High chill types, yields likely to be low to very low this year: many apples, some apricots, Northern highbush blueberries, sweet cherries, many peaches and nectarines, some pears, European (prune) plums, walnuts. Should we shift to planting low-chill varieties? Probably not now or in the near future. It is expected that chilling hours will decrease in the Sacramento Valley by 20 – 25% over the next several decades. But it won't be a straight-line decline; there will be warmer winters, and colder winters. The lifespan of a fruit tree is a couple of decades. Your kids should probably give this some thought if they go into walnut production. You and I probably don't need to make drastic changes in our selection of varieties. Why not plant low-chill varieties anyway? Because most of the best-flavored types of peaches and nectarines have higher chill requirements, and this isn't an issue most years. Elberta, Loring, and O'Henry peaches – all among the tops for flavor – require about 800 hours. Rio Oso Gem and Redhaven peach and Independence nectarine require 900 hours. The latter two are important commercial varieties. But for home gardeners the occasional low-crop year is more than compensated by the quality in other years. If you want some insurance, just add a lower-chill type nearby. * June Gold cling peach and Goldmine nectarine can all take 450 hours or less. 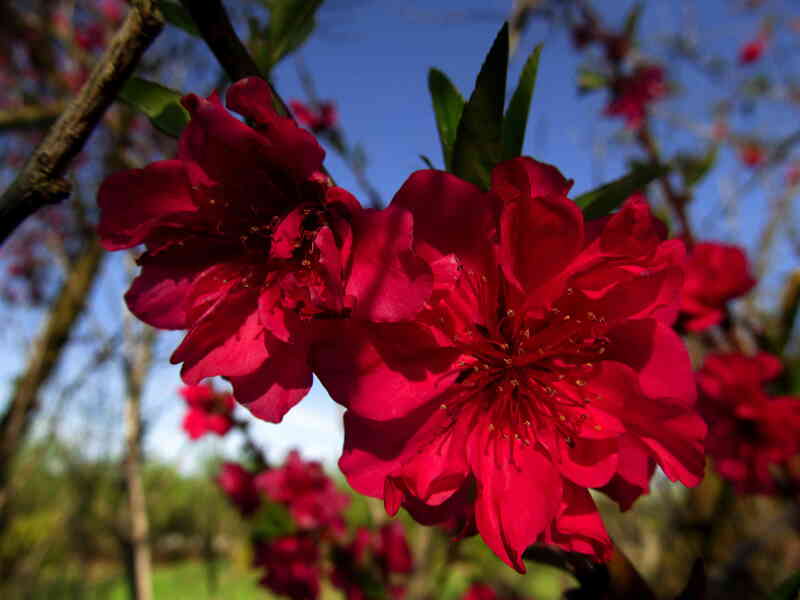 Red Baron peach, which has spectacular flowers and very good fruit that ripens over several weeks, only requires 250. * In pears, the Asian types only need 400 – 450 hours. European varieties Kieffer and Moonglow are fine with 400 – 500 hours; Pineapple only needs 200. Those also have good fireblight resistance, which is important in selecting pears. Better-known varieties such as Bartlett and d'Anjou have higher needs at 800 and 700 hours respectively (and very poor fireblight resistance). * Lower-chill apples include Anders, Fuji, Gala, Granny Smith, and Pink Lady, all less than 500 hours. Gravenstein (700) and Honeycrisp (800) may have poor yields this year. Many heirloom apple varieties have high chilling requirements. * Harcot apricot, recommended for brown rot resistance, needs 700 hours, but the ever-popular Blenheim only requires 4 – 500. Fruit trees aren't the only plants affected by a lack of winter chilling. I expect there will be reduced bloom on lilacs and peonies. Lilac varieties differ, with some having been bred for tolerance of warmer winters, so results will vary. In sum: nurseries and master gardeners are going to spend a lot of time this summer answering the question "why didn't I get fruit?" Answer: the winter was too warm for some of our favorite types of fruits and nuts. There's always next year!